Dr. Caro is a 2017 graduate of the prestigious Temple University, Kornberg School of Dentistry. He grew up in Bucks County, PA and has recently relocated to northern New Jersey. He first fell in love with dentistry after a childhood mishap left him in awe of his own dentist’s exquisite dental work. His curiosity and enthusiasm began to grow as soon as he left the dentist chair, and propelled him on the path to Dentistry. He attended the University of Pittsburgh and graduated with a Degree in Biology. There, he was the Vice president of the Dental Science club and was a teaching assistant and tutor for Organic chemistry. During Dental school his love for travel and community service led him to volunteer his time by providing oral health care to the residents of Grange Hill on the Island nation of Jamaica, which turned out to be one of the most gratifying experiences for him. 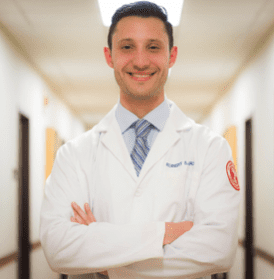 After dental school, he was accepted and completed one of the most academically challenging and rewarding residencies in the county at the Newark Beth Israel Medical Center; a Robert Wood Johnson-Barnabas Heath Hospital. From care for children, senior members of the community, to the medically and physically challenged, Dr. Caro has shown passion for providing high quality care with a touch of his engaging personality. He is presently participating in a two year part time Dental Implant Surgical and Prosthetic program at the New York University College of Dentistry. This is the greatest new vista in the field of Dentistry. The ability to replace missing teeth back to form and function using cutting edge surgical techniques together with digital age dentistry. In his free time Dr. Caro enjoys playing the guitar and piano, running, tennis, and yearly trips to Australia.